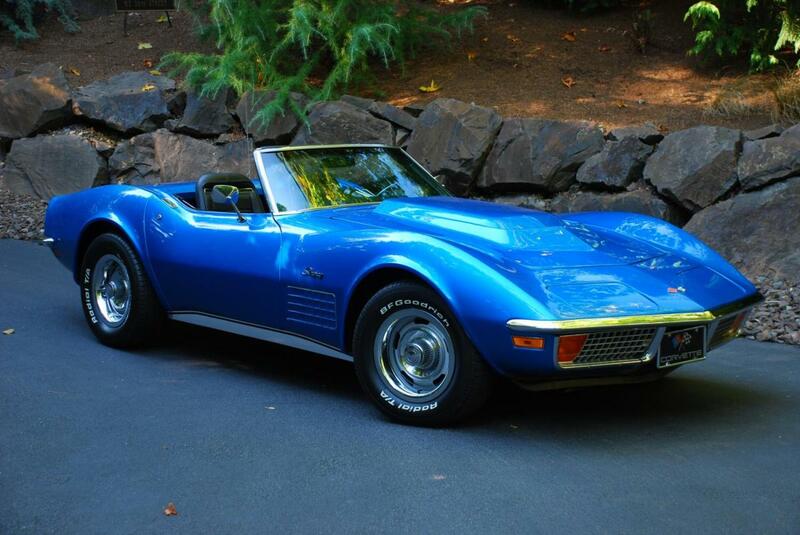 Although its arrival was anticipated by consumers and critics alike, there were virtually no physical or mechanical changes made to the 1972 Corvette from the previous year. 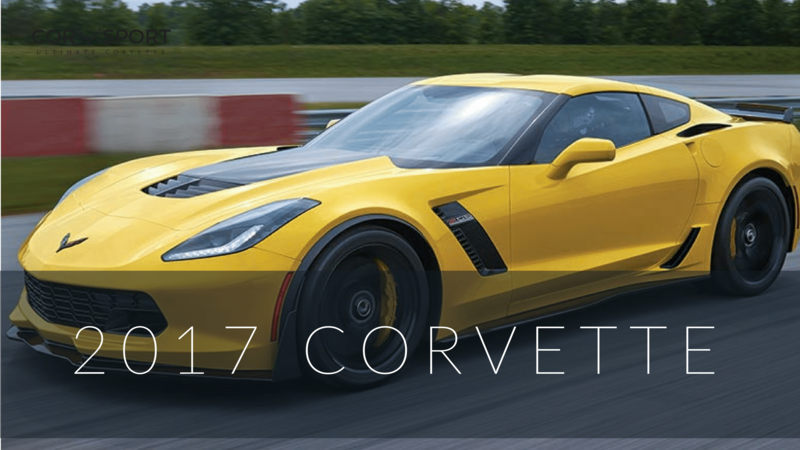 In fact, the most dramatic “changes” made to the current model year involved items that were no longer available to prospective owners when ordering a new Corvette. To start, consumers could no longer order the optional ZR-2 package, due to General Motors elimination of the aluminum headed LS-6 from the Chevrolet engine lineup. 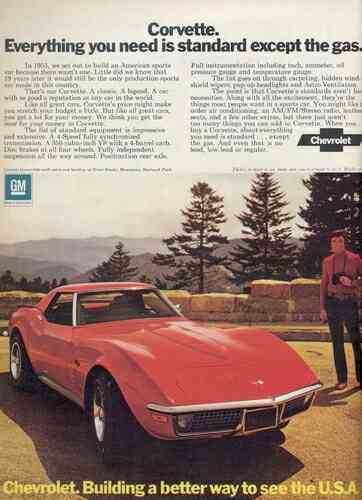 Previously, consumers looking to purchase a Corvette had had the option of including the 454 cubic inch big block LS-6 either on its own or as part of RPO ZR2, but because of incredibly poor sales numbers the previous year (only 188 Corvettes with the LS6 engine and a meager 12 Corvettes equipped with RPO ZR2 were sold), GM felt that the eradication of the engine was a necessity. 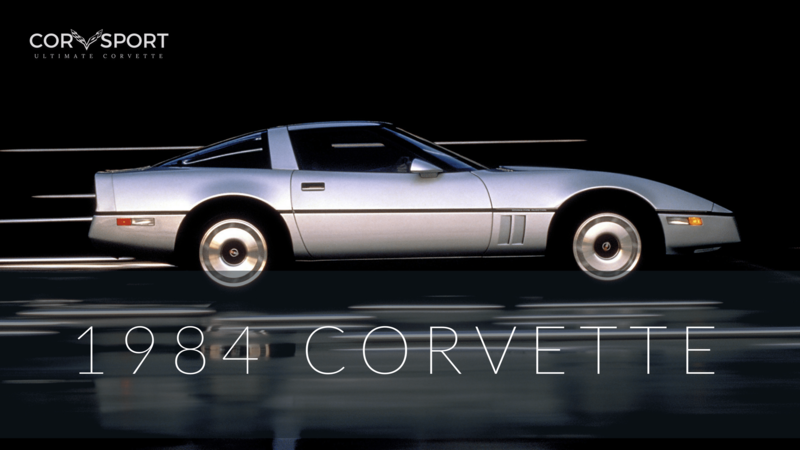 To that end, only three engines were listed for the Corvette in 1972, which made it the smallest selection since the 1956 model. 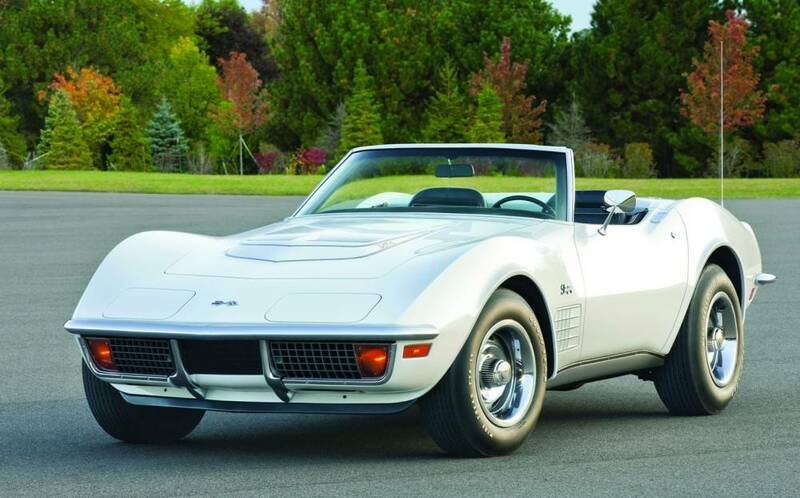 All three – the base optional LT-1 small block, and the optional LS-5 big block – were all carry over engines from the 1971 model year, and each of these had more conservative power ratings than their 1971 predecessors. All of the engines offered in 1972 suffered a loss in power because of the mandatory inclusion of emissions-lowering tuning that year. Furthermore, as was becoming common amongst all automotive manufacturers, GM was now measuring engine outputs in the new SAE “net” measure for the 1972 model year. The choice to use the net numbers instead of the “gross” horsepower measurements was the result of power losses caused by mandatory equipment such as the water pump, alternator, power-steering pump, mufflers, and air cleaner. While the ratings were universally lower, they were also more realistic. The base engine, designated ZQ-3, was rated at a conservative 200 brake horsepower. 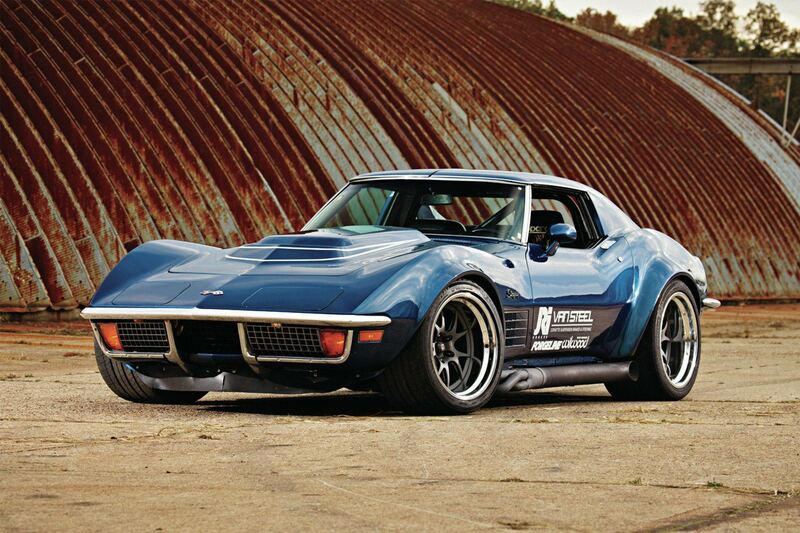 The LT-1 was rated at 255 horsepower and the LS-5 was rated only slightly higher at 270 horsepower. 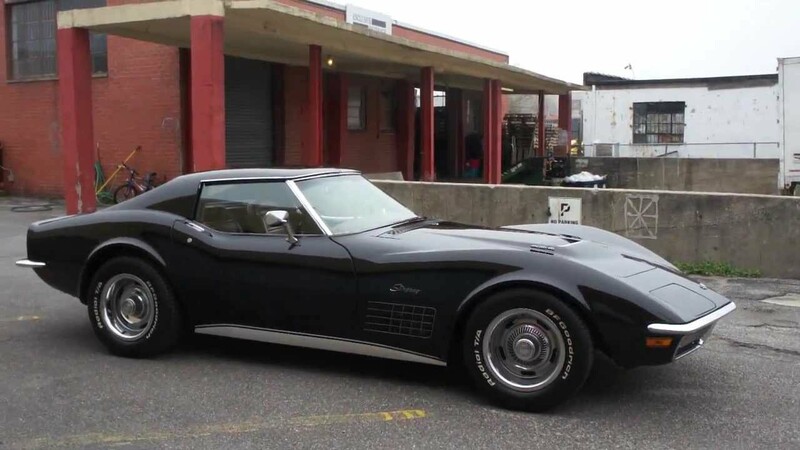 Additionally, then race-car driver Tony DeLorenzo test-drove the 1972 Corvette and stated “you can’t get a better overall performance car. 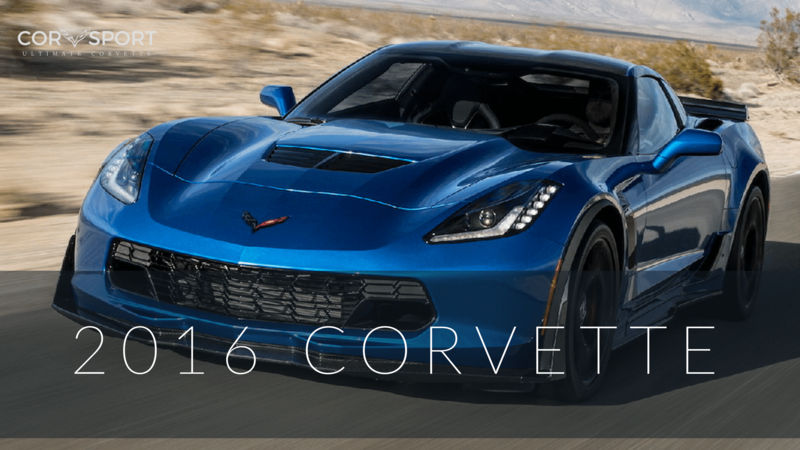 I’d be hard-pressed to find a better car for the money, then the ‘Vette. It’s just an incredible automobile. 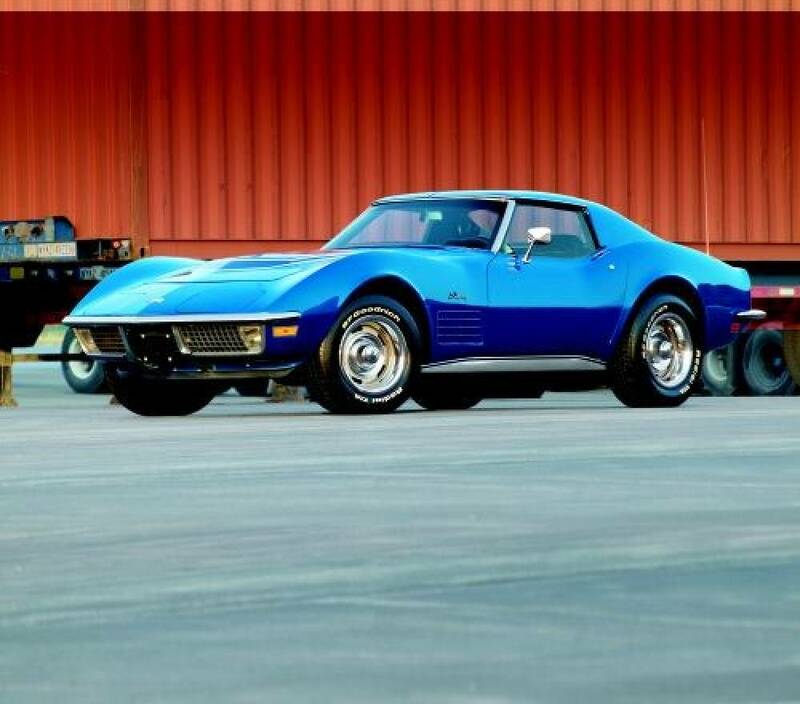 Perhaps the most unfavorable “cut” to the 1972 Corvette was Chevrolet’s failure to complete emissions certification of the Mark IV LS-5 in time to clear it for sale in California, where limits on oxides of nitrogen had been imposed that didn’t apply in the other forty-nine states. Chevrolet knew that the LS-5 was capable of passing these tests, but Chevrolet had simply lacked the manpower to certify every engine/car combination that it had wanted to, and as a result, the LS-5 – due in large part to its low production numbers – was dropped from the test series. Some critics have been quick to question Chevrolet’s decision not to fully support this certification process given that California contained the second-largest Corvette customer base (behind Michigan) at that time. 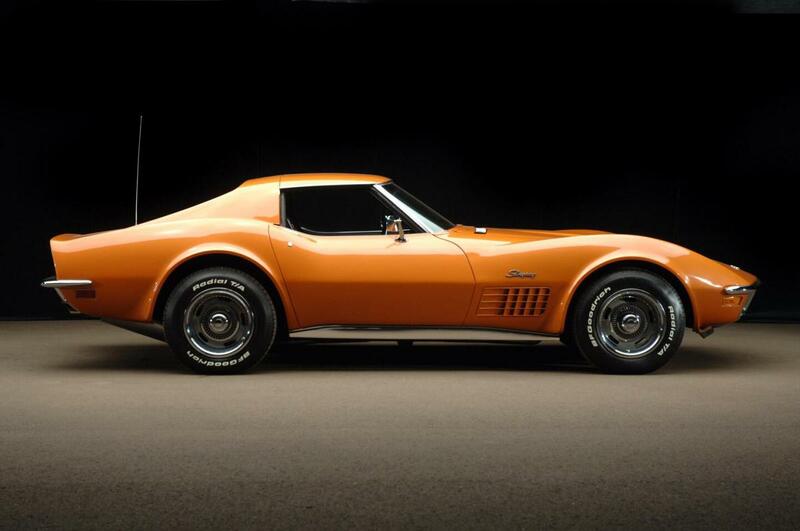 Beyond the realignment of GM’s engine program, there were virtually no other notable changes made to the 1972 Corvette with the following exceptions: For 1972, the fiber-optic light monitoring system was dropped and an all-new center console was designed to take its place. Additionally, Chevrolet standardized the horn-honking burglar alarm, which was now included on every new model. The alarm system could be armed and disarmed via a lock cylinder at the rear of the car. When armed, the alarm would sound whenever either the hood or the doors of the car were opened. The alarm – which utilized the factory car horn – would continue honking until the owner’s key was used in the special alarm lock cylinder. 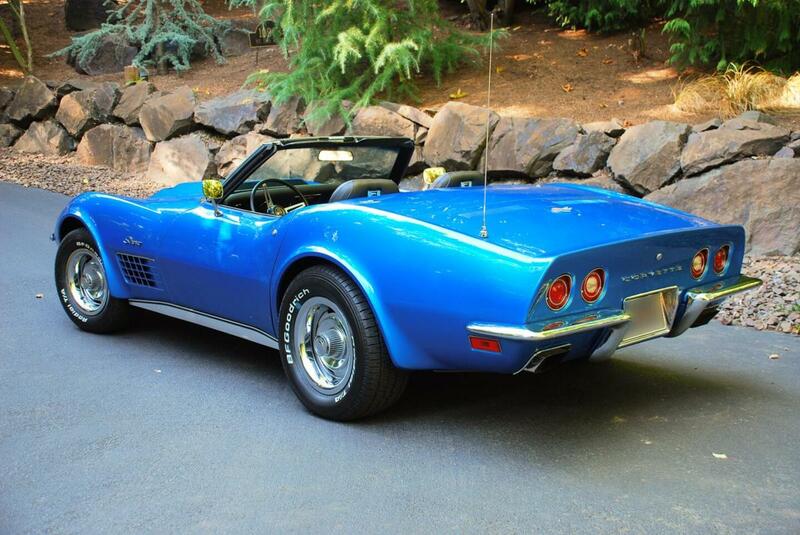 Pricing of the 1972 Corvette did decrease slightly thanks to the repeal of a Federal excise tax on December 11, 1971. 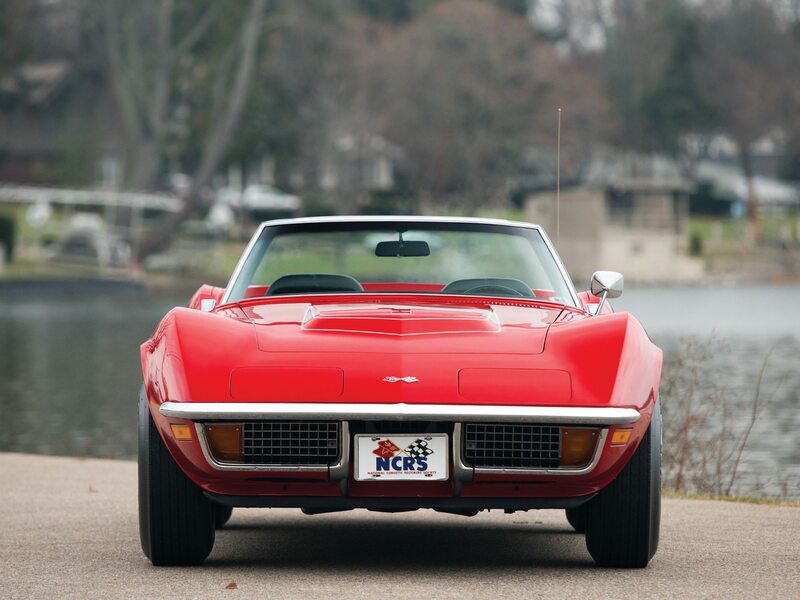 In total, 20,496 Corvette coupes with a base price of $5,533.00, and 6,508 convertibles with a base price of $5,296.00 were sold in 1972, which was an improvement of nearly 5,200 units over the 1971 model year. 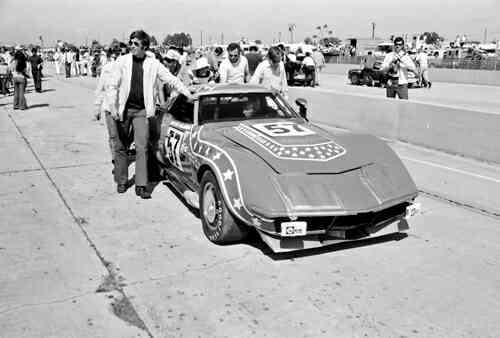 The 1972 racing season would continue to see a strong presence from Corvette, though the car itself would also serve as a test-bed for new tire designs being developed by some of the largest tire manufacturers in the business. 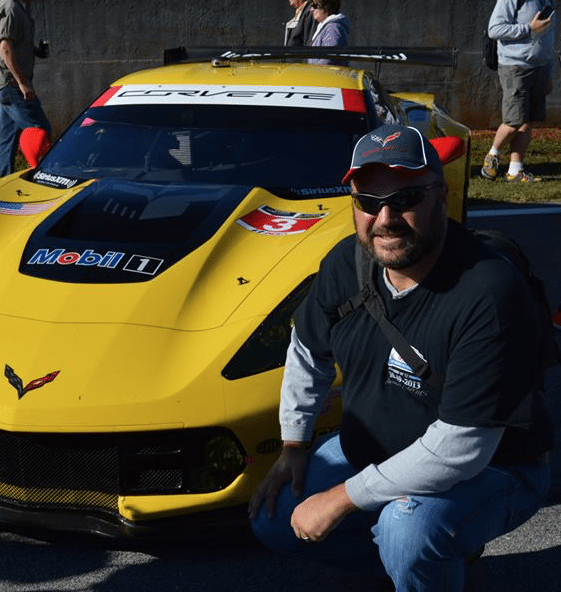 While the Corvette made an excellent race car, its combination of weight and speed were very demanding on the car’s tires. Both B.F. Goodrich and Goodyear recognized (and decided to take advantage of) this fact to show Detroit that radial-ply tires were more durable and could be utilized on more vehicles than ever before – even under the toughest driving conditions. Goodyear would lead this “race-within-races” on the basis of outstanding performance (and race results) of Dave Heinz and Robert Johnson, who drove the No. 57 Chevy Corvette of Dave Heinz racing to a GT class victory (and took 8th overall) on February 6, 1972 at the “Six Hour Daytona Continental-World Manufacturers Championship Race” (more commonly known as part of “the 24 Hours of Daytona” today). 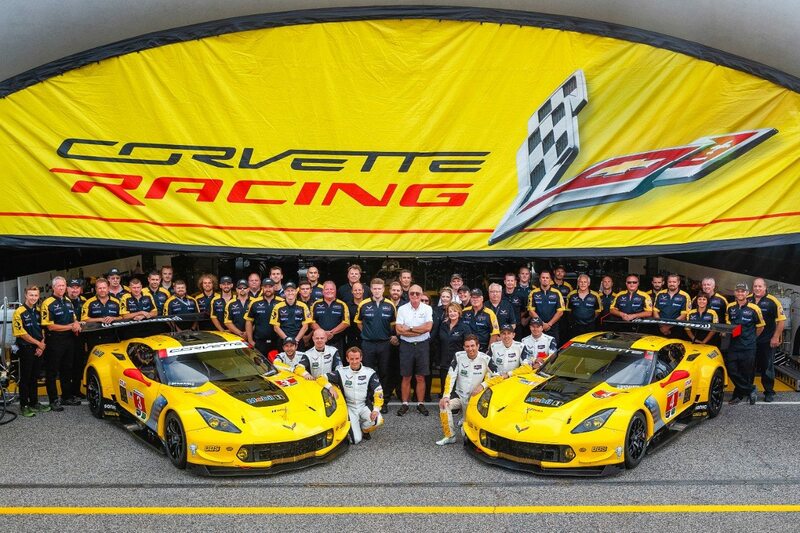 Far more impressive, however, was that this same team would take another GT finish and (an overall fourth place finish) on March 25 at the “12 Hours of Sebring.” Their fourth place finish amongst all racing classes that year was the best overall finish Corvette had ever seen to that point in its racing history. CONSTRUCTION: Uniconstruction: fiberglass reinforced plastic (FRP or “fiberglass”) body, backboned by a steel cage outlining the passenger compartment. Principal members – underbody, front and rear end assemblies, dash panel and hinge pillars are bonded, riveted, or bolted together and to each other. Hood is plastic with bonded plastic reinforcement. Coupe: two removable roof panels and removable rear window. Frame: all welded, full length, ladder construction with 5 crossmembers. Side Rails and intermediate crossmembers box section; front crossmember box girder section. Eight body-mounting points. Type and Description: Independent, SLA type, coil springs with center mounted shock absorbers, spherical joint steering knuckle pivots. Type and Description: Full Independent rear suspension with frame-anchored differential unit. Position of each wheel established by three links: tubular axle drive shafts, transverse strut rods, torque control arms. Vertical suspension loads taken by transverse leaf springs. Built-in camber adjustment at strut rod inner ends. Type Semi-reversible gear with ball-nut driven by recirculating anti-friction bearings, energy-absorbing steering column, steering damper attached to relay rod; two position steering knuckle arm attachment for street and fast ratio steering. Adjustable steering column available optionally. 5XXXXX (Eighth thru Thirteenth Digits) Plant Sequence Numbers. The last six digits begin at 500001 and run thru 527004, accounting for all 27,004 Corvette Coupes/Convertibles built in 1972. Each Vehicle Identification Number (VIN) is unique to an individual car. On the driver’s side upper left-hand door hinge pillar. A01 – Body build date code. A – Designates the Month (See Chart Below). 01 – Designates the Day of the Month. All engines are stamped on the top front of the right-hand bank of cylinder and case. V – Engine build location. 0127 – Date Code. Month and Day. 0127 – January 27. CPJ – Type Designation. CPJ – 454ci 270hp, automatic transmission. 4-Speed (Muncie) – Stamped on the top right side of the case at adapter. Turbo Hydra-matic Automatic – Name plate tag on right-hand side of case. E01D – Production Month and Date. A – Jan. / B – Feb. / C – Mar. / D – Apr. / E – May / H – June / K – July / M – Aug. / P – Sept. / R – Oct. / S – Nov. / T – Dec.
01 – Designates Day of the month. D or N – Designates Day or Night Shift on Automatic only. 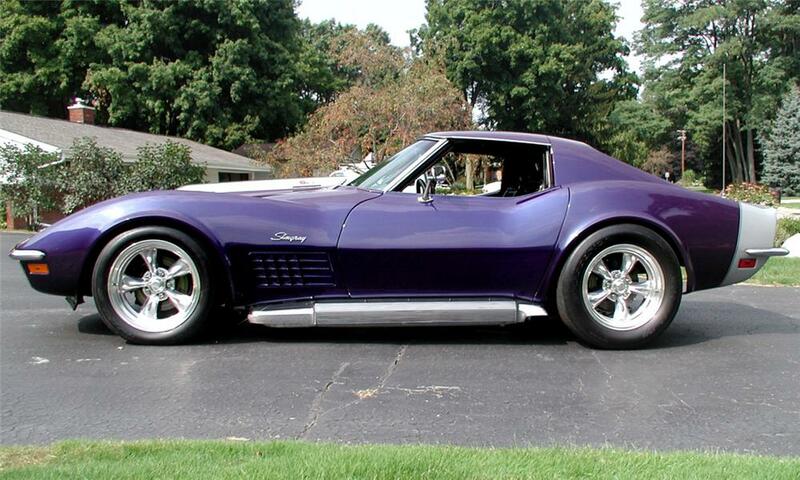 The base price of the 1972 Chevrolet Corvette Coupe without any optional equipment. 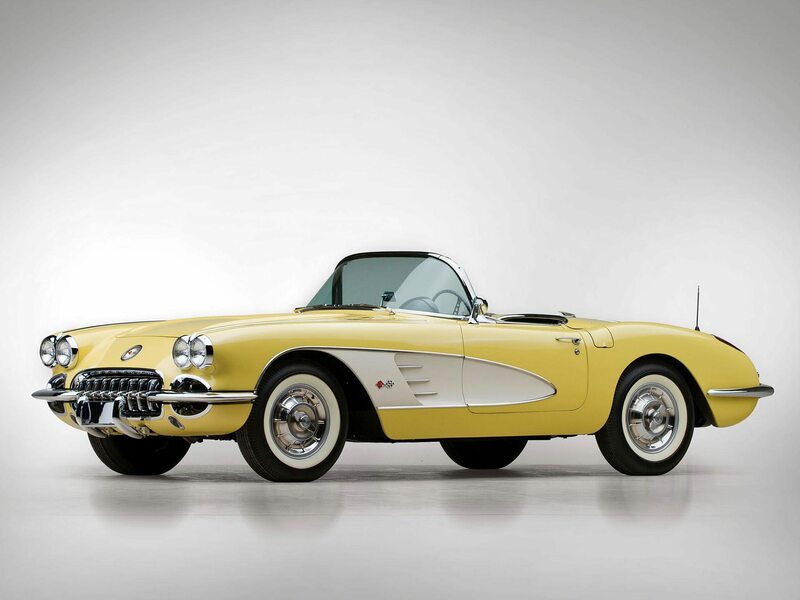 A 350 cubic inch, 200 horsepower engine, 4-speed wide ratio manual transmission, vinyl interior trim, and T-tops were included in the base price.Base Corvette Convertible (19467) – The base price of the 1972 Corvette Convertible without any optional equipment. A 350 cubic inch, 200 horsepower engine, 4-speed wide ratio manual transmission, vinyl interior trim, and a convertible top were included in the base price. Optional interior trim upgrade that included a number of custom modifications to the base interior. The custom interior trim includes leather seat trim, wood-grain accents and carpet trim on door panels, wood-grain accents on the console, and cut-pile carpeting. A three-point belt in a Y-shaped arrangement. The seatbelt design features three separate mounting points of connection to the car. The connection points are located at the right lap mount, left lap mount, and at the shoulder mount. Factory installed power driver and passenger windows. An addition to the standard lap safety belt that crosses over the shoulder for added safety. 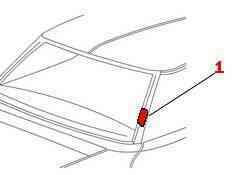 The shoulder belts option were included with all Corvette coupes at no additional charge. 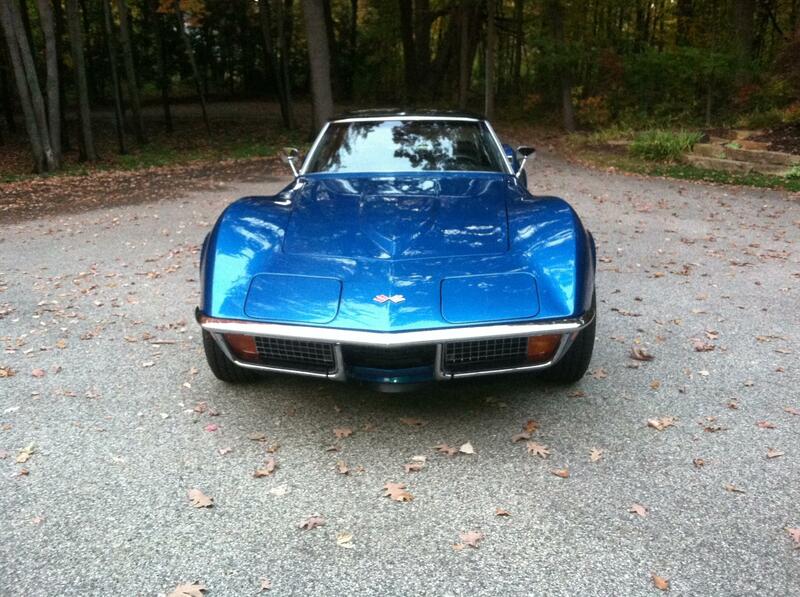 The option was also available on the Corvette convertible, but at an additional cost. An optional hard-top that could be installed in lieu of the convertible top. This option provided an external vinyl liner application to the auxiliary hardtop. The vinyl covering provided a faux convertible top appearance even when the hardtop was mounted on the car. An optional rear window forced air defroster. This option was not available to consumers when the RPO ZR1 was ordered. System includes evaporator, blower, condenser, receiver-dehydrator, refrigerant (freon) tank, air intake assembly and duct assembly for both systems. Manually controlled by knobs on instrument control panel. Includes dual circuit master cylinder. Reactor assembly in the fuel/air injection system. Used to mix fresh air with hot exhaust gases to burn off the unburned gasoline in an effort to reduce emissions. Optional high-output, big-block V-8 engine. Optional higher-output, small block V-8 engine. A close ratio version of the M20 Muncie 4-speed manual transmission. The gear ratios for the RPO M21 Close Ratio 4-Speed Manual Transmission are: 1st Gear – 2.20:1, 2nd Gear – 1.64:1, 3rd Gear – 1.28:1, 4th Gear – 1.0:1 (Direct). An optional, three-speed automatic transmission. The Turbo Hydra-Matic Automatic Transmission consisted of a 3-element hydraulic torque converter and compound planetary gear set. It was equipped with the following gear ratios: 1st Gear – 2.48:1, 2nd Gear – 1.48:1, and 3rd Gear – 1.00:1. The M40 Turbo Hydra-Matic Automatic Transmission was a no-cost option with the base 350 cubic inch, 200 horsepower engine, but cost an additional $97 when ordered with the 454 cubic inch, 270 horsepower LS5 engine. It was not available with the LT1 or the ZR1 options. An optional, adjustable steering column and tilt-angle adjustable steering wheel. The Telescopic Steering Column changed the drivers distance from the steering wheel by literally telescoping the steering wheel closer to or further away from the vehicle operator. Standard size tires with a special 3/8″ wide white sidewall stripes. Standard size tires with special raised white lettering. A larger than standard battery with added cranking power and capacity. The Heavy Duty Battery option (T60) was included when the LS5 was ordered. It featured an 80AH rating and included 90 plates. A standard/stock dealer installed Corvette radio.. This radio only broadcasted a mono signal. An optional, dealer installed Corvette radio. This radio option provided a true stereo signal. This radio featured green lettering. An assembly line emissions test to conform with California registration requirements. Not available when the LS5 engine was ordered with the car. Optional performance and handling upgrade. 1972 ZR1’s did not have metal fan shrouds. 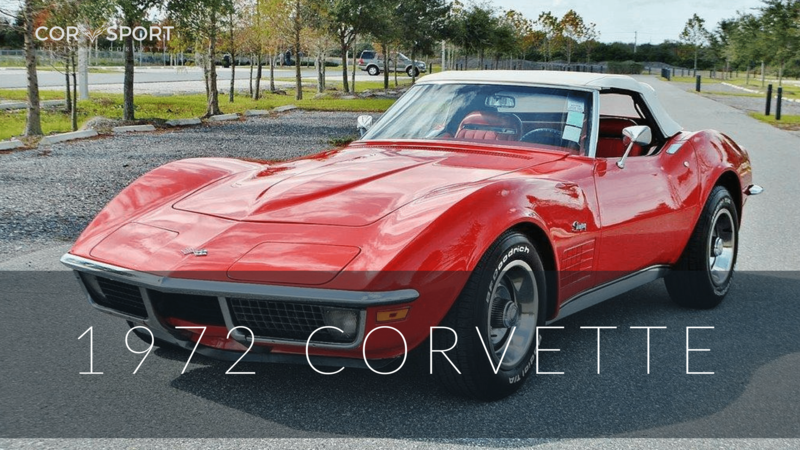 When the ZR1 option was ordered, the following options were not available on the 1972 Corvette: Power Windows (A31), Rear Window Defroster (C50), Air Conditioning (C60), Power Steering (N40), Deluxe Wheel Covers (P02), AM-FM Radio (U69), AM-FM Radio, Stereo (U79). Repeal of the Federal Excise Tax on December 11, 1971 reduced retail prices. 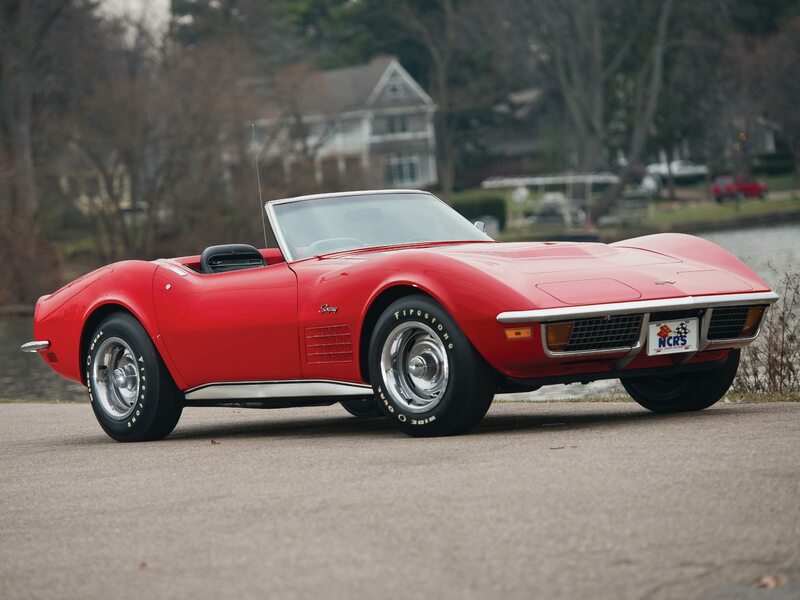 There were virtually no appearance changes for the 1972 model year, but the significance of this model year is that it represented the “end of an era” for the third-generation Corvette. 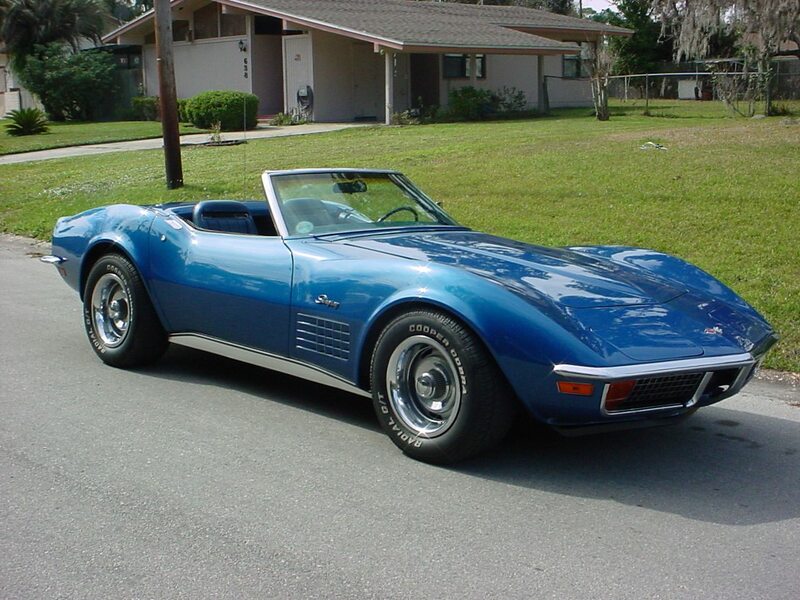 The 1972 Corvette was the last to feature both front and rear chrome bumpers, a bright egg-crate grill, side-fender grills (later models do have function vents and some have vent trim), and a removable rear window, which was a feature that was unique for the 1968-1972 model years. 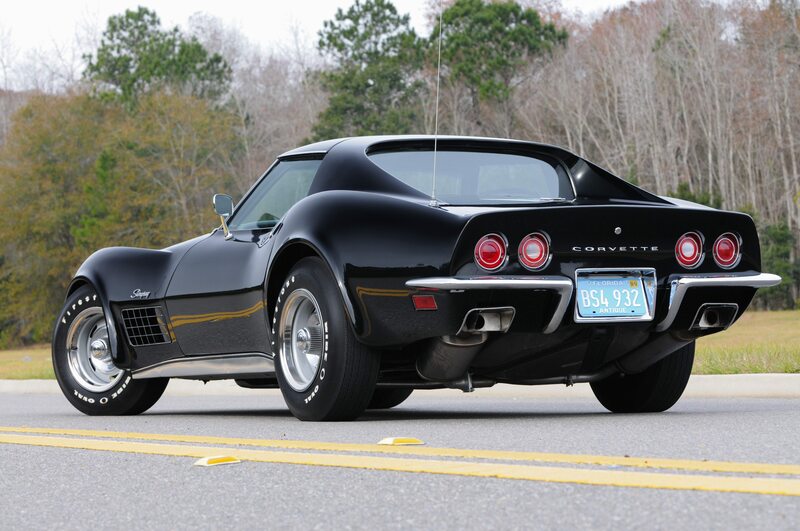 The 1972 Corvette did not include the fiber-optic light-monitoring system used in 1968-1971 models, although the previously optional alarm system was now a standard feature (the horn sounding type) and was included in the car’s base price. The 1972 decrease in horsepower rating was mainly the result of the measurement criteria. While previous horsepower ratings were measured in “gross” output of the engine, the 1972 ratings used a more realistic, more real-world “net” horsepower. The net horsepower took into consideration losses in horsepower from the air cleaners, exhaust systems, and accessories. REMANUFACTURED REAR BRAKE CALIPERS, PART NOS. 18-7019, 18-7020, 16-7019, AND 16-7020, MANUFACTURED FROM FEBRUARY 1, 2002, TO APRIL, 25, 2003., AND FOR USE ON 1965 THRU 1982 CHEVROLET CORVETTES. THE SUBJECT BRAKE CALIPERS WERE MANUFACTURED USING IMPROPERLY MANUFACTURED PISTON SEALS. THESE SEALS ARE INTENDED TO PREVENT FLUID LEAKAGE BETWEEN THE CALIPER HOUSING AND THE PISTONS. THESE BRAKE CALIPERS ARE FOR USE ONLY ON 1965 THRU 1982 CHEVROLET CORVETTE VEHICLES. THIS RECALL DOES NOT INVOLVE GENERAL MOTORS CORPORATION OR ANY OF ITS PRODUCTS. UNDER THESE CONDITIONS, THE VEHICLE OPERATOR MAY NOT BE ABLE TO STOP THE CAR, POSSIBLY RESULTING IN A VEHICLE CRASH. CARDONE WILL NOTIFY ITS CUSTOMERS AND ALL UNSOLD INVENTORY WILL BE REPURCHASED AND WILL PROVIDE A FULL REFUND TO CUSTOMERS. OWNER NOTIFICATION IS EXPECTED TO BEGIN DURING MAY 2003. OWNERS WHO TAKE THEIR VEHICLES TO AN AUTHORIZED DEALER ON AN AGREED UPON SERVICE DATE AND DO NOT RECEIVE THE FREE REMEDY WITHIN A REASONABLE TIME SHOULD CONTACT CARDONE AT 215-912-3000. ALSO, CUSTOMERS CAN CONTACT THE NATIONAL HIGHWAY TRAFFIC SAFETY ADMINISTRATION’S AUTO SAFETY HOTLINE AT 1-888-DASH-2-DOT (1-888-327-4236). The time or mileage intervals indicated on this website are intended as a guide for establishing regular maintenance and lubrication periods. Sustained heavy duty or high speed driving, or driving under adverse conditions may require more frequent servicing. Remove air cleaner and block throttle and choke in wide open position. Hook up starter remote control cable and insert compression gauge firmly in spark plug port. Whenever the engine is cranked remotely at the starter, with a jumper cable or other means, the distributor primary lead must be disconnected from the negative post on the coil and the ignition switch must be in the “ON” position. Failure to do this will result in a damaged grounding circuit in the ignition switch. Crank engine through at least four compression strokes to obtain highest possible reading. Check and record compression of each cylinder. If one or more cylinders reads low or uneven, inject about a tablespoon of engine oil on top of pistons in low reading cylinders (through spark plug port.) Crank engine several times and recheck compression. If compression comes up but does not necessarily reach normal, rings are worn. If compression does not improve, valves are burnt, sticking or not sealing properly. If two adjacent cylinders indicate low compression, the cause may be a head gasket leak between the cylinders. Engine coolant and/or oil in cylinders could result from this defect. The adjustments described apply to all carburetors used, except as noted. All adjustments are made with the engine at normal operating temperature. The idle stop solenoid requires two idle speed settings. The curb idle speed is normal engine idle speed, the low idle speed is set for conditions when the solenoid is de-energized, as when the ignition is turned off. This prevents engine run-on. Idle speed adjustments are made with the engine at normal operating temperature, with the air cleaner on, choke open, air conditioning off, and fuel tank hose from vapor canister disconnected (on later models). Set parking brake and block driving wheels. Disconnect electrical connector at idle stop solenoid. With automatic transmission in Drive, or manual transmission in neutral, turn low idle screw to obtain low idle speeds of 500 rpm, reconnect electrical connector to solenoid and crack throttle slightly, to extend solenoid plunger. Then turn approximately 600 rpm for automatic transmission models in Drive, or approximately 850 prm for manual transmission models in neutral. Shut off engine and reconnect fuel tank to vapor canister. The idle mixture is factory preset and the screws are capped with plastic limiter caps. These caps allow about one full turn for adjustment. If more is required remove the caps or break off the tabs with needle nose pliers. Adjusting the idle mixture is done with the engine running at normal operating temperatures, with the air cleaner on, choke open, air conditioning off, and fuel tank hose from canister disconnected. Set the parking brake and block the driving wheels. Put automatic transmission in Drive; manual transmission in neutral. Turn in or out one idle mixture screw at a time to obtain smoothest, fastest idle speed; then adjust the other screw to make engine run even smoother and faster. A basic starting point for adjusting screws is four turns out from fully in position with needle just touching seat. Readjust idle speed if necessary. Reconnect fuel tank hose from canister. All adjustments are same as previously described except as follows: On models equipped with idle stop solenoid, adjust idle stop solenoid screw to give 1000 rpm, then adjust idle mixture adjusting screw to specified rpm. Turn idle mixture screw in (leaner mixture) until engine speed drops 20 rpm, then turn out 1/4 turn. Disconnect lead at idle stop solenoid (throttle level will rest against regular stopscrew.) Adjust this stopscrew for idle speed of 500 rpm. Do not change setting of idle stop solenoid stopscrew or idle mixture screw. With the transmission in neutral, position the cam follower on the high step (2nd step, 1971-1972) of the fast idle cam. Adjust fast idle screw of Rochester carburetors to obtain recommended fast idle speed. Bend fast idle lever on Holleys. On 1970-72 models, disconnect transmission controlled spark solenoid. With slow idle speed correctly adjusted, fully open choke and make sure fast idle cam follower is off steps of cam. With dashpot fully compressed, adjust for 1/16″ clearance between dashpot plunger and throttle lever. Remove the air cleaner and check to see that choke valve and rod more freely. Disconnect choke rod at choke lever. Check choke adjustment by holding choke valve closed and position rod so that it contacts stop. If necessary, adjust rod length by bending rod at offset. Bend must be such that rod enters choke lever hole freely and squarely. Connect rod at choke lever and install air cleaner. The A.I.R. system is used to burn the unburned portion of the exhaust gases to reduce its hydrocarbon and carbon monoxide content. The system forces compressed air into the exhaust manifold where it mixes with the hot exhaust gases. The hot exhaust gases contain unburned particles that complete their combustion when the addition air is supplied. The system consists of: An air pump, diverter valve, check valve(s), AIR pipe assemblies and connecting hoses and fittings. Carburetors and distributors for AIR engines are made to be used with the system and should not be replaced with components intended for use with engines that do not have the system. The air pump is a two-vane pump which compresses fresh filtered air and injects it into the exhaust manifold. The pump consists of: a housing, centrifugal filter, set of vanes that rotate about the centerline of pump housing bore, the rotor, and the seals for the vanes. The centrifugal filter is replaced by first removing the drive belt and pump pulley; then pulling filter off with pliers. Care should be taken to prevent fragments from entering the air intake hole. NOTE: A new filter may squeal when first put into operation. Additionally, GREAT CARE should be taken in working on the compressor as the aluminum used is quite soft and thin. The air pump is operating satisfactorily when the air flow from it increases as engine speed increases. The air hoses should be replaced only with hoses which are designed for AIR system use, as no other type hoses can withstand the high temperature. Start engine then check ignition dwell. With engine running at idle, raise the adjustment screw window and insert an Allen wrench in the socket of the adjusting screw. Turn the adjusting screw as required until a dwell reading of thirty degrees is obtained. A two degree variation is allowable for wear. Close access cover fully to prevent the entry of dirt into the distributor. If a dwell meter is not available, turn adjusting screw clockwise until engine starts to misfire, then turn screw one-half turn in the opposite direction to complete adjustment. Slowly accelerate engine to 1500 rpm and note dwell reading. Return engine to idle and note dwell reading. If dwell variation exceeds specifications, check for worn distributor shaft, worn distributor shaft bushing or loose breaker plate. Remove distributor cap, clean cap and inspect for cracks, carbon tracks and burned or corroded terminals. Replace cap where necessary. Clean rotor and inspect for damage or deterioration. Replace rotor where necessary. Replace brittle, oil soaked or damaged spark plug wires. Install all wires to proper spark plug. Proper positioning of spark plug wires in supports is important to prevent cross-firing. Tighten all ignition system connections. Replace or repair any wires that are frayed, loose or damaged. Disconnect the distributor spark advance hose and plug the vacuum source opening. Start engine and run at idle speed. Aim timing light at timing tab. The markings on the tabs are in two degree increments (the greatest number of markings on the “A” side of the “Q”). The “O” marking is TDC (Top Dead Center) and the BTDC settings fall on the “A” (advance) side of the “O”. Adjust the timing by loosening the distributor clamp and rotating the distributor body as required, then tighten the clamp, and recheck timing. Stop engine and remove timing light and reconnect the spark advance hose. Inspect each plug individually for badly worn electrodes, glazed, broken or blistered porcelains and replace plugs where necessary. Clean serviceable spark plugs thoroughly, using an abrasive-type cleaner such as sand blast. File the center electrode flat. Inspect each spark plug for make and heat range. All plugs must be of the same make and number. Adjust spark plug gaps to .035 in. using a round feeler gauge. If available, test plugs with a spark plug tester. Inspect spark plug hole threads and clean before installing plugs. Install spark plugs with new gaskets and torque to specifications. Connect spark plug wiring. There are no moving parts in the ignition pulse amplifier, and the distributor shaft and bushings have permanent type lubrication, therefore no periodic maintenance is required for the magnetic pulse ignition system. Check the distributor centrifugal advance mechanisms by turning the distributor rotor in a clockwise direction as far as possible, then releasing the rotor to see if the springs return it to its retarded position. If the rotor does not return readily, the distributor must be disassembled and the cause of the trouble corrected. Check to see that the vacuum spark control operates freely by turning the movable breaker plate counter-clockwise to see if the spring returns to its retarded position. Any stiffness in the operation of the spark control will affect the ignition timing. Correct any interference or binding condition noted. Examine distributor points and clean or replace if necessary. Contact points with an overall gray color and only slight roughness or pitting need not be replaced. Dirty points should be cleaned with a clean point file. Use only a few strokes of a clean, fine-cut contact file. The file should not be used on other metals and should not be allowed to become greasy or dirty. Never use emery cloth or sandpaper to clean contact points since particles will embed and cause arcing and rapid burning of points. Do not attempt to remove all roughness nor dress the point surfaces down smooth. Merely remove scale or dirt. Clean cam lobe with cleaning solvent, and rotate cam lubricator wick end (or one-hundred-eighty degrees as applicable). Replace points that are burned or badly pitted. Where prematurely burned or badly pitted points are encountered, the ignition system and engine should be checked to determine the cause of trouble so that it can be eliminated. Unless the condition causing point burning or pitting is corrected, new points will provide no better service than the old points. Check point alignment then adjust distributor contact point gap to .019″ (new points) or .016″ (used points). Breaker arm rubbing block must be on high point of lobe during adjustment. If contact points have been in service, they should be cleaned with a point file before adjusting with a feeler gauge. Check distributor point spring tension (contact point pressure) with a spring gauge hooked to breaker lever at the contact and pull exerted at 90 degrees to the breaker lever. The points should be closed (cam follower between lobes) and the reading taken just as the points separate. Spring tension should be 19-23 ounces. If not within limits, replace. Excessive point pressure will cause excessive wear on the points, cam and rubber block. Weak point pressure permits bouncing or chattering, resulting in arcing and burning of the points and an ignition miss at high speed. Install rotor and distributor cap. Press all wires firmly into cap towers. The top of the battery should be clean and the battery hold-down properly tightened. Particular care should be taken to see that the top of the battery is kept clean of acid film and dirt. When cleaning batteries, wash first with a dilute ammonia based or soda solution to neutralize any acid present and then flush off with clean water. Keep vent plugs tight so that the neutralizing solution does not enter the cell. The hold-down bolts should be kept tight enough to prevent the batter from shaking around in its holder, but they should onto be tightened to the point where the battery case will be placed under a severe strain. To ensure good contact, the battery cables should be tight on the battery posts. Oil battery terminal felt washer. If the battery posts or cable terminals are corroded, the cables should be cleaned separately with a soda solution and wire brush. After cleaning and before installing clamps, apply a thin coating of a petrolatum to the posts and cable clamps to help slow corrosion. If the battery has remain undercharged, check for loose or defective fan belt, defective alternator, high resistance in the charging circuit, oxidized regulator contact points, or a low voltage setting. If the battery has been using too much water, the voltage output is too high. Inspect for deteriorated or plugged hoses. Inspect all hose connections. On engines with closed element air cleaners, inspect crankcase ventilation filter and replace if necessary. On engines with open element air cleaners, remove flame arrestor and wash in solvent then dry with compressed air. Check the brake fluid regularly, for as the brake pads wear the level will drop rapidly. It should be replenished only with the recommended fluid. Check disc brake assemblies to see if they are wet; it would indicate a leaking cylinder. Disc brakes do not need periodic adjustments; they are self adjusting. The pads should be replaced when the friction material gets down to 1/16″. This is when the groove in the center of the pad is gone. Check by removing wheel and looking directly into caliper. Check clutch action by holding pedal 1/2″ from floor and move shift lever between first and reverse several times, with engine running. If shift is not smooth adjust clutch. Free play with pedal released is approx. 1-1/4″ to 2″ and 2″ to 2-1/2″ for heavy duty. At clutch lever near firewall remove clutch return spring. To decrease clutch pedal free play remove clutch pedal return spring and loosen lower nut on clutch pedal rod; take up play with upper nut. Continue until proper play is obtained, then securely tighten top nut and replace spring. To increase pedal play work nuts in opposite sequence. Disconnect control linkage at carburetor throttle lever. Hold carburetor throttle lever in wide position. Pull control linkage to wide open position. (On vehicles equipped with automatic transmission, pull through detent.) Adjust control linkage to freely enter hole in carburetor throttle lever. Connect control linkage at throttle lever. Remove air cleaner, disconnect accelerator linkage at carburetor. Disconnect accelerator return and trans. road return springs. Pull upper rod forward until transmission is through detent. Open carburetor wide open, at which point ball stud must contact end of slot in upper rod. Adjust swivel on end of rod if necessary. Disengage the snap lock and position the carburetor to wide open throttle. Push the snap lock downward until the top is flush with the rest of the cable. Pull detent switch driver to rear until hole in switch body lines up with hole in driver. Insert a 3/16″ pin through hole to depth of 1/8″, and loosen mounting bolts. Open throttle fully and move switch forward until lever touches accelerator lever. Tighten mounting bolt and remove pin. A rough idling engine may be caused by a malfunction of the valve. Check by pinching vacuum hose to carburetor with engine idling. If idling smooths out, the valve should be removed for cleaning or replacement if something appears to be broken. The car should be standing on level ground and the oil level checked with the dipstick. Withdraw the dipstick, wipe it with a clean rag, replace and withdraw again. The mark made by the oil on the lower end of the dipstick will indicate the oil level. If necessary, oil should be added through the filler cap. Never let the oil level fall so low that it does not show at all on the dipstick. If in doubt, it is better to have a bit too much oil than too little. Never mix oils of different brands, the additives may not be compatible. Place a pan under the oil pan drain plug and remove plug. Be sure pan is of a large enough capacity to hold the oil. Move pan under filter and remove filter by turning if counterclockwise. Clean gasket surface of cylinder block. Coat gasket of new filter with engine oil. Thread filter into adapter. Tighten securely by hand. Do not overtighten filter. Remove drop pan. Remove drain pan. Inspect oil pan drain plug gasket and replace if broken, cracked, or distorted. Install drain plug and tighten. Fill crankcase to required level with recommended oil. Operate engine at fast idle and check for oil leakage. Crankcase Capacities: 327 & 350 Engines – 4 quarts, 427 & 454 Engines – 5 quarts. When changing oil filter, add one additional quart. Check fluid level with engine idling, transmission in neutral and engine at normal operating temperature. Add fluid as needed to bring level to mark. Do not overfill. Hydra-Matic transmission should be replaced. Refill Capacity: Powerglide – 2 quarts, Turbo Hydra-Matic – 7-1/2 quarts. Raise car on lift, clean dirt and grease from area around the filler plug. Plug is located on side of transmission case. Remove plug and place finger tip inside hole. The oil should be just about level with the bottom edge of the hole. Add oil as needed, using a plastic syringe. Change cam lubricator end for end at 12,000 mile intervals. Replace at 24,000 mile intervals. With the car standing level, clean dirt and grease from area around filler plug. Remove plug and place finger tip inside hole. The oil should be just about level with the bottom edge of the hole. Add oil, with a plastic syringe, as needed. 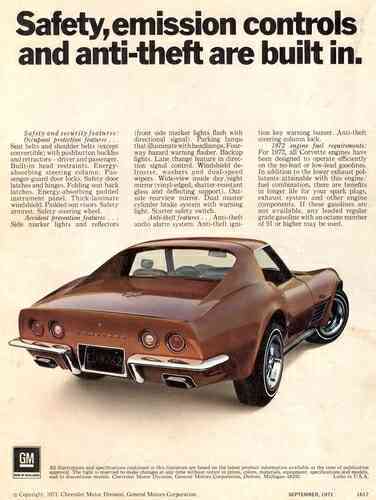 Download this 1972 Corvette Dealers Sales Brochure for a quick look at the features of the car. CORVETTE: Sports Car Superstar – Copyright 2005, PIL – Publications International, Ltd.
Corvette Black Book – Copyright 2009, Michael Bruce Associates, Inc.
Will Mid-Engine Corvette Have Electric Doors? No 1973 info? When one clicks on the link to year 1973, the 1972 info pops up. Gary, we’ll take a look. What page are you clicking on that’s taking you to the wrong page? 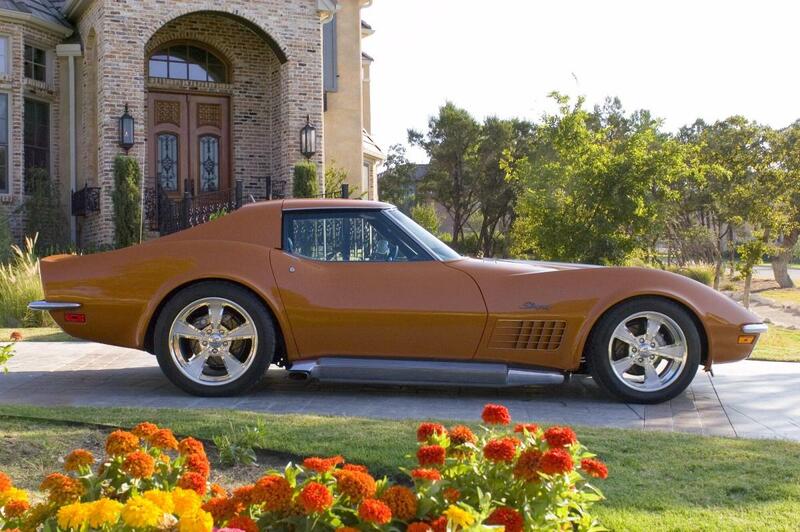 It could just be a broken weblink – we definitely have a ton of information on the 1973 Corvette. 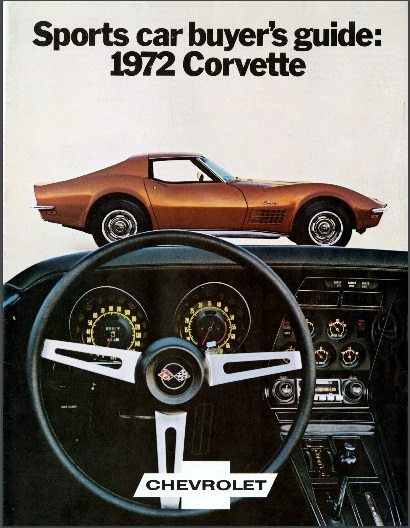 We corrected the link on our C3 Corvette Overview page and you should now be able to navigate to the 1973 model year page. Thanks for letting us know!